Small package bump cylinder pusher is meant for use with rigid containers, such as cans or plastic bottles running at high production rates. 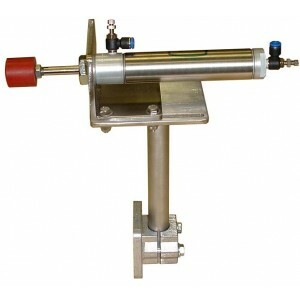 This device includes a vertical and horizontally adjustable mounting bracket. Stroke lengths are available from 6” to 10” wide belt conveyors. This device is rated for weights up to 2 lbs and rates up to 100 per minute.